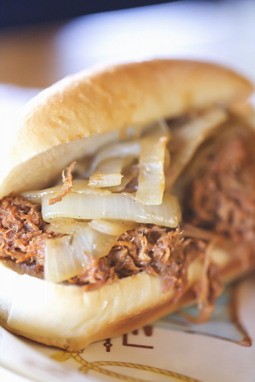 Pulled Pork Sandwich - A recipe from Savor California, the online showcase for extraordinary gourmet foods and beverages from California. Season pork roast with Smokey Salty Bronc seasoning and put into crock pot. Add about 2” of orange juice or beer. Cook on low about 6 to 8 hours until tender. Remove and drain off liquid. Pull apart with fork and mix with your favorite Cowboy BBQ Meat Moppin' Sauce. Sauté yellow onions with a little olive oil. Add 2 tablespoons bourbon just before taking off heat. Pile pulled pork and onions on French roll for hearty dinner.